Pure Encapsulations is one of the oldest supplement companies around and currently has over 200 products. This company was created as a result for a demand of hypoallergenic supplements. What this means is that Pure Encapsulations creates supplements that are free from food allergies such as wheat, gluten, eggs, peanuts, magnesium stearate, trans fats and hydrogenated oils. Those with food intolerances often turn to Pure Encapsulations for their supplement needs for this reason. Pure Encapsulations states that their supplements should only be taken when recommended and supervised by qualified health professionals. 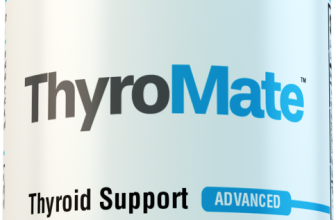 Let’s see how Pure Encapsulations Thyroid Support Complex ranked in our review. 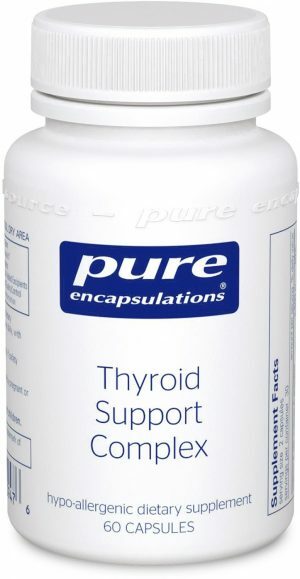 WHAT IS Pure Encapsulations Thyroid Support Complex? Pure Encapsulations state that their blend of certain vitamins, minerals and herbs nourishes the thyroid gland and supports healthy thyroid cell metabolism. I’m not exactly sure what they mean by ‘thyroid cell metabolism.’ Are they are suggesting their supplements allows the thyroid to work faster to produce the triiodothyronine and thyroxine hormones? Maybe they’re being confusing on purpose or perhaps the FDA did not allow them to directly state that claim. Nevertheless, let’s look at the ingredients in this thyroid support complex. Each capsule of this thyroid supplement contains: vitamin A, vitamin C, vitamin D, iodine, zinc, selenium, l-tyrosine, ashwagandha, forskohlii, guggul, turmeric, and ascorbyl palmitate. Most of these ingredients are well known and studied with thyroid activity. It is recommend you take two a day with meals. The first ingredient to look at in thyroid support supplements is iodine. It is by far the most important nutrient that the thyroid needs. In fact, the hormones T3 and T4 are actually named due to this mineral: the numbers 3 and 4 indicate how many iodine atoms are bonded to the hormone. So it’s a good sign that Pure Encapsulations included this in their supplement. The accompanying minerals and amino acids zinc, selenium, and l-tyrosine are another good sign. They have all been shown to be linked to healthy thyroid function and as referenced in many articles throughout this website, and others, these nutrients assist in thyroid hormone production. However, the vitamins and some of the herbs are less proven. While Ashwagandha is recognized to help thyroid function, the studies are still inconclusive of vitamin A, C, herbs such as guggul, according to the University of Maryland Medical Center. However, what concerns me more is that there is no vitamin B12 in this supplement. Many studies have shown that hypothyroid patients are often deficient in vitamin B-12. According to this study published in 2008, supplementing vitamin B12 in these patients diet improved their symptoms of hypothyroidism. If you take this thyroid support complex, it might be helpful to make sure you cover all your bases and get another vitamin B12 supplement as well. It is also important to note that Pure Encapsulations state on each bottle of thyroid support complex that pregnant or lactating women should not take this supplement. Perhaps this is because Pure Encapsulations decided to include vitamin A and D in this supplement. Large doses of these vitamins have been linked to birth defects. Nevertheless, it is very critical to follow their directions and not take this supplement if you are pregnant or trying to become pregnant. If you have any existing health conditions, or are taking other medication, Pure Encapsulations also states that you should consult a health professional. Perhaps they are trying to free themselves of any liability, but all these caution labels seem alarming. I guess it makes sense since their website states that their supplements should only be taken when supervised by qualified physicians. This supplement seems to have a higher rate of side effects than other thyroid complexes we have seen. The manufacturer, Pure Encapsulations, themselves have also stated on their product page that some of the ingredients in this thyroid supplement may cause nausea, vomiting, diarrhea, headache or fatigue. The plant Guggul is often associated with skin rashes and Pure Encapsulations state this might occur with sensitive individuals. It seems strange why a company that focuses on hypoallergenic supplements decided to include this herb. They must believe the benefits of this plant outweigh the negatives. This study does seem to suggest guggul supports thyroid function, but only when ingested in very large quantities. Some reviewers have also noted experiencing these side effects. Even though you might not be intolerant to the ingredients, unwanted effects may occur. Others have also said they felt little to no changes after taking the supplement for a month. Many more, however, have reported noticeable improvements. If you take this supplement and do not experience the side effects, it is likely it will improve some aspects of thyroid function. I was diagnosed with hisimoto thyroiditis a few months ago. When I first started taking the thyroid support complex it slowly made my stomach upset. After about 2 months of taking the supplement my throid function improved by leaps and bounds, however suddenly I took one and had vomiting then diarrhea for about 24 hours. I wasn’t sure if I had a stomach virus (which has been going around in my area) but after a week of staying off the supplement I tried again and began to vomit and have diarrhea agian. At this point its obvious that one or more ingredients are effecting my digestive system. Any suggestions on a supplement that has a less likely hood of these side effects? - CONS: Makes me violently ill. This is the second thyroid supplement I’ve taken and I am starting to lose weight, finally…even following low carb and keto before that, I was getting really frustrated. So, it’s helping with that aspect of my subclinical hypothyroidism…now if it would help with my dead libido and dry skin and hair…I would be thrilled…no side effects so far. A new holistic doctor recommended this product but I had side effects with it. I have tried lowering to one capsule daily with same side effects. Then I tried opening the capsule and adding just 1/4 of the powder to my smoothie but still have side effects. I got fibromyalgia pains back with this supplement, I wonder what ingredient would be causing me the pains. I continued to open the capsule and add some little amount of powder in my smoothie and now I can tolerate it without side effects. I hope to increase the amount to be able to see the benefits. Great idea! This way of taking the thyroid supplement helps those who have trouble swallowing capsules as well.